Vocal booth to go was invited to attend the 2018 Podcast Movement convention in Philadelphia. 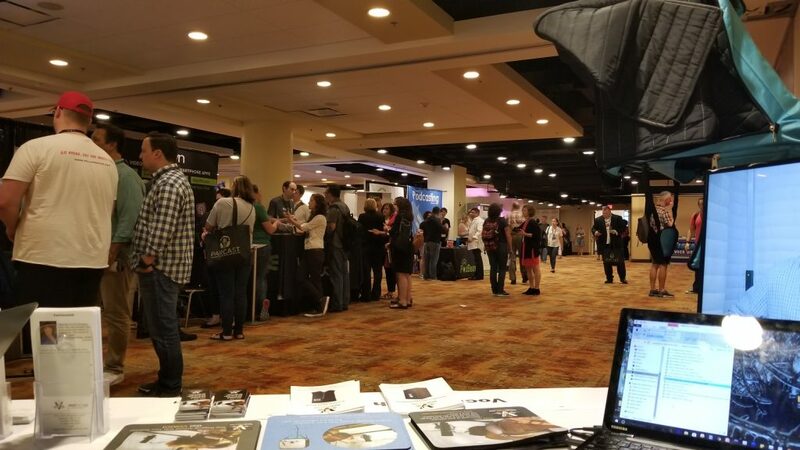 We talked with many of the 2500 podcasters who were there and they have a chance to check out the mobile/portable/carry-on vocal booth, VOMO. Voice Over Mobile Booth – VOMO! This video features reactions from the podcasters reviewing the VOMO in the worst case scenario of a recording situation involving 2500 people in the same room! The VOMO worked very impressively, as you will see from the video. We also had one podcaster who asked about shooting videos in the VOMO, so we set her up with everything she would need to make it happen. Check out the results! Podcasters were also asking us about a larger booth for doing interviews, so this would be the place to start. The AVB33 is our acoustically treated booth that would allow a booth you can get inside of. For two people interviews, start at the AVB63 to get enough room for a few chairs and mics. This entry was posted in Acoustic Mobile Vocal Booth, For traveling Voice Actor, Success Stories, Videos, Vocal Booths. Bookmark the permalink.